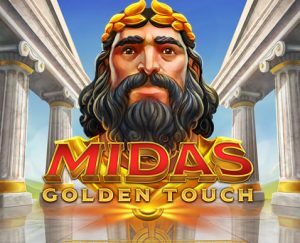 Enter the magnificent marble palace of the ancient Greek king in Midas Golden Touch, a 5 reel, 15 payline slot game from Thunderkick. Highlights here include multiplier wilds that can combine to boost payouts by up to 32x. There’s also a bonus round where you can win up to 30 free spins complete with streak re-spins. Play on your PC, tablet or mobile device from 10p to £100 per spin. Like most slot games in the Thunderkick catalogue, the design here is very high spec and superbly done. King Midas’s columned palace forms the backdrop to the action here. On the reels you’ll see A to 9 royal values as well as a treasure chest, a chalice and a golden crown. The bearded figure of King Midas is the top paying standard symbol, awarding 10, 20 or 75 times your stake if you land 3, 4 or 5 on a payline. Land 3 or more of the temple scatter symbol and you’ll trigger the Bonus Game feature and with it, 10, 15 or 20 free spins. Land a winner during the feature and the successful symbols are locked in position and the reels spin again. The respins keep on coming as long as a new winning symbol joins the winning cluster. This is known as the Sticky Respin feature. Also, 1 wild is added at random somewhere on the middle 3 reels on each of your free spins. Re-triggers are possible too if you manage to land 3 or more scatters on the same free spin. With 10 more free spins to be won, you could play with 30 free spins in total. As in the base game, wins with multipliers will benefit from multipliers up to 32x. The ancient myth and legend theme is a hugely popular one with slot game players and developers. We’re in safe hands with Thunderkick. The visuals are here as bright and sharp as you’ll find anywhere. There’s a very decent array of features on offer too, especially in the Bonus Game feature where the streak respins can really get things moving. The medium to high variance means that it packs a decent payout punch too – there’s up to 10,100 times your stake to be won from each spin/free spin. The key to winning big is to get big multipliers from the wilds. If you like the myth and legend theme, then Midas Golden Touch is definitely worth a spin. If you want King Midas to turn your bankroll into gold, I also recommend you try Age of the Gods: Mighty Midas (by Playtech). T&Cs Apply 18+. New GB Customers and first deposit only. Spins only available on Starburst. Deposit and play through £25 on selected games and get 25 spins OR; Deposit and play through £100 on selected games and get 100 spins OR; Deposit and play through £200 on selected games and get 200 spins. 3 day expiry of spins after they have been added. 14 days from registration to claim offer. You have a right to withdraw your cash deposit or any remaining cash deposit and any cash winnings from this deposit. If this is withdrawn, the spins and any winnings from the spins will be forfeited. All winnings from the spins will be paid out cash. Further eligibility and terms apply.